Just got the first message from Harry the man himself. He is OK , and made it to the top of the world yesterday! Leaving Camp 3 at 1:00, after staying at 8300m for two consecutive nights, he arrived at the summit quite late, at 14:00 local time. After this he had to fight, exhausted, to get out of the deathzone and back to Camp 3, where he arrived at 22:00. All this time he was accompanied by his personal sherpa Lakcha. After staying another night at 8300m, he is now on his way back to ABC. With the confirmation of Harry's summit this means that yesterday three expedition members reached the summit of Everest: Dmitry Moskalev, Harry Kikstra and John Christiana, together with Sherpas Mingma Norbu, Renji and Lakcha. During the final summit push Lorenzo had to return after reaching around 8600m, because of problems with his eyesight. This is Harry's sixth summit of the Seven. congratulations from Lon & me. You managed to keep us in quite some suspense yesterday, but we're thrilled to read this excellent news. What an enormous achievement! Be safe now on the way down from 7,700 metres. Erik... thanks for the updates. Congrats to ya Harry for pulling this one out. Congrats to all of you and your sherpas on this adventure... summit or no summit. So much drama... no more, okay!?! Just make it safely down and back to your homes. John... you friggin' AMAZE me! Can't wait to talk to and see you. Just spoke to Harry on his Satelitephone. He is at 7300 m. now, decending to ABC. His voice was very weak, he was exhausted but still able to go on. Apart from his tiredness and his throat he's in good shape, healthy. He expected that he would have to walk for another 3 or 4 hours before he could reach ABC. Also both the sherpa's were ok.
Good work Harry, proud on you, congratulations!!! happy to hear you're able to get down yourself, otherwise I had to come over to catch you and next flight is just tomorrow! Helemaal Top Harry, van harte!!!!!!!!!!!!!!!!!!!!!!!!!!!!!!!!! Ben benieuwd naar je verhalen! Only one summit left too - incidentally did you do your usual summit pose? How do you sign "SIX DOWN, ONE TO GO"? Or have you extra fingers? Maybe you used a hand and a foot together? Ouch! Had eigenlijk niet anders verwacht. Van harte gefeliciteerd Harry. Ik weet wat dit voor je betekent na de ellende van vorig jaar. Ik ben erg benieuwd naar je filmmateriaal en verhalen. Een fantastische prestatie die de perikelen van vorig jaar overschaduwt. Misschien kan ik in 2006 de klus afmaken. Ik zie je uitgebreide verhaal op deze site graag tegemoet. Doe Dmitri Moskalev ook de groeten van mij. Top dat hij ook boven is gekomen. Heb je nog iets gezien van de vermiste klimmer? You deserved the summit. 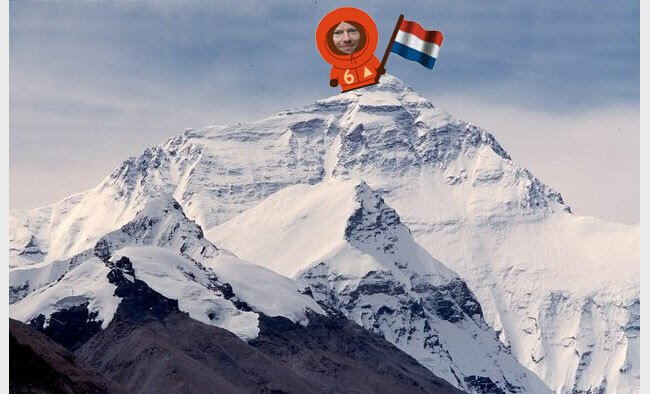 Congrats to everybody on the team summit or not, must be something to be over 8000m. Have a safe return home. So happy and congratulations on your summit!!!! "My Range Rover on Mt. Pinatubo's crater rim"
congrats harry ! safe travel to you and the rest of the team !